Friday July 26th 1878 It was nine oclock when I got home this morning. I did a little house-work and then began work again on my polinaise. I got it done by night. Mother spent the afternoon in town. We had a letter from Hatt and a postal from Rob. They got through safely. It cleared of pleasant. Saturday July 27th 1878 I began fixing my grey suit and had lots of trouble with it. I was very tired of sewing and rested an hour in the afternoon. Mother spent the afternoon at Moores. I read all the evening. A letter from Will Reed which I answered. 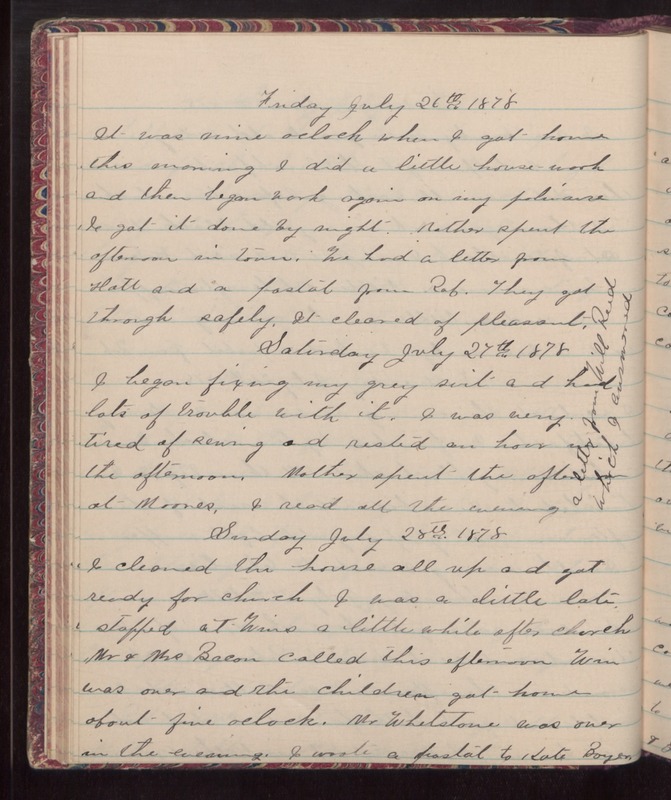 Sunday July 28th 1878 I cleaned the house all up and got ready for church. I was a little late stopped at Wins a little while after church. Mr & Mrs Bacon called this afternoon. Win was over and the children got home about five oclock. Mr Whetstone was over in the evening. I wrote a postal to Kate Boyer.